Back in time before bridges, ferries were used to get people and supplies across the local rivers. One such ferry was used on a early trail between Auburn and Cool. Today this is our Pardner Rock trail. The river end on the El Dorado Co. side washed away when the coffer dam collapsed in 1992. Trail volunteers are working to get the trail back in service on that side. On the Placer Co. side the trail is in good shape. Directions: From the Courthouse, take Lincoln 1/3 mile and go Left on High street (Highway 49), Go ½ mile on 49 to go R on Borland, go straight at the stop, now on Brooks. Take Brooks to next stop go R on Marvin for .2 miles to go L on Robie. Take Robie to its end at .5 miles where there is a small parking lot. The trail starts behind Gate #134 as unpaved road. Take the trail down ¼ mile to the WST, go left 200 feet and find the steepish trail dropping down on the Right; this takes you down to the old railroad grade. Follow to the L about a mile and watch for the Pardner Rock trail leaving along the right side. (see map for alternatives). Going down the Pardner Rock is a straight shot to the river. Imagine a ferry waiting at the bottom to ferry you across for 25 cents. 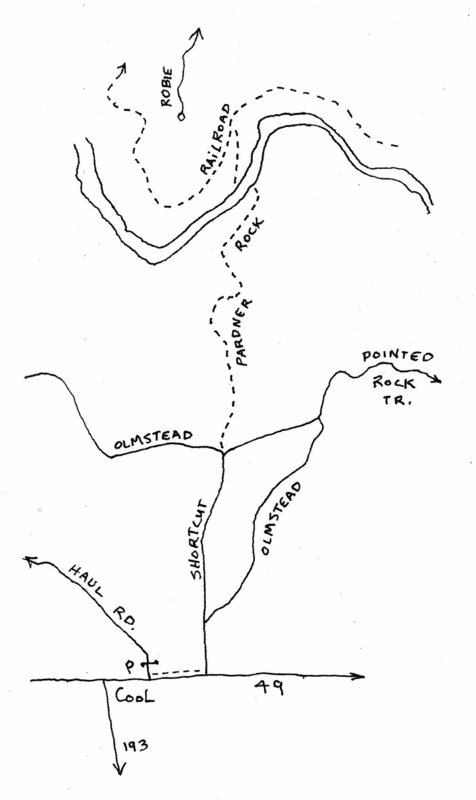 The trail can also be accessed from the Olmstead Loop trail on the El Dorado side of the canyon. This primitive trail needs work as it has a difficult stream crossing along its way. More work will make it a fun one, especially if we get that ferry back in service.